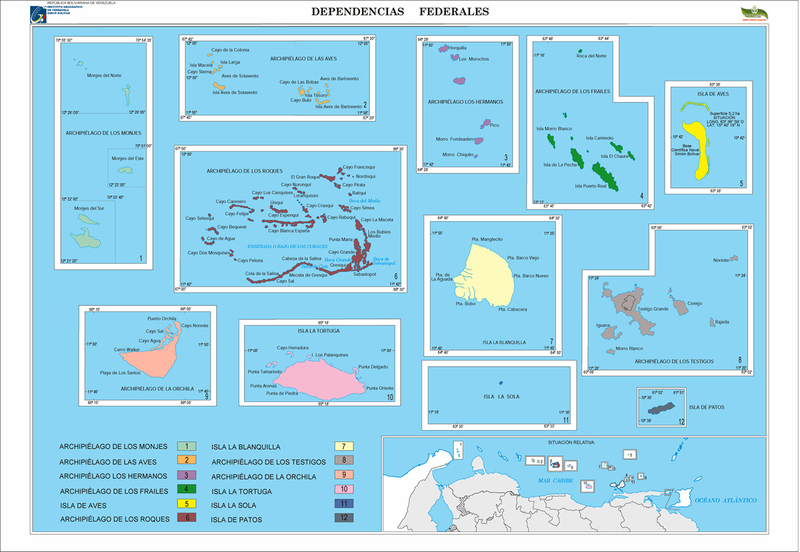 The Federal Dependencies of Venezuela (Spanish Dependencias Federales de Venezuela) encompass most of Venezuela's offshore islands in the Caribbean Sea and the Gulf of Venezuela, excluding those islands which form the State of Nueva Esparta. These islands, with a total area of 342 square kilometres, are sparsely populated – according to the preliminary results of the 2011 Census only 2,155 people live there permanently, with another hundred from Margarita Island who live there seasonally to engage in fishing. Local government is under the authority of the mayor of Caracas. ↑ República de Venezuela y República Dominicana. 1981: Tratado de relimitación de áreas marinas y submarinas entre la República de Venezuela y República Dominicana. Ministerio de la Defensa. Caracas. 8p. Wikimedia Commons has media related to Federal dependencies of Venezuela.